I am scheduled for MRI (Magnetic Resonance Imaging) tomorrow. Why I will be having that? This is because I am suffering from an unexplained constant headache which can't be ruled out by the CT scan (computed tomography) alone. The neurosurgeon at the Queen Elizabeth Hospital in Selly Oak, Birmingham was in doubt, that is why, he planned to put me under MRI. 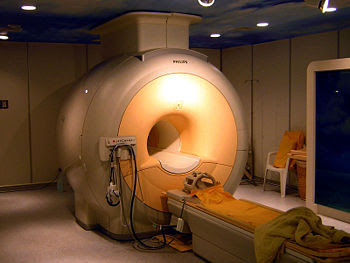 MR imaging uses a powerful magnetic field, radio frequency pulses and a computer to produce detailed pictures of organ s, soft tissues, bone and virtually all other internal body structures. The images can then be examined on a computer monitor, printed or copied to CD. MRI does not use ionizing radiation (x-rays). I had my CT scan last month and the initial findings showed that I have an slight enlargement of the pineal gland. The pineal gland (also called the pineal body, epiphysis cerebri, or epiphysis) is a small endocrine gland in the vertebrate brain. It produces melatonin, a hormone that affects the modulation of wake/sleep patterns and photoperiodic (seasonal) functions. It is shaped like a tiny pine cone (hence its name), and is located near to the centre of the brain, between the two hemispheres, tucked in a groove where the two rounded thalamic bodies join. This is quiete scary since this will be my first time to go under the table. Even if I am one of the medical staff but still, I can't control myself from being anxious. My very good friend, Mayette is offering to accompany me in going to the hospital. I am also frightened of whatever they will find. I am praying so hard to God and to Jesus Christ for giving me good health and I really believe in God's power. I am really hoping that it will be a good result with the help of God, Jesus Christ and Mother Mary. i have already been praying for you. do not let them touch your pineal! pray and meditate, child. pray and meditate.meditate on the word of God Genesis 32:30 So Jacob called the place Peniel, saying, "It is because I saw God face to face, and yet my life was spared." the bible is full of esoteric knowledge pointing towards meditating on the word of God. Uy mao bah Loy? I hope everything will be fine. Keep us posted!